A few weeks ago, I stumbled onto the Marine Environmental Research Institute. 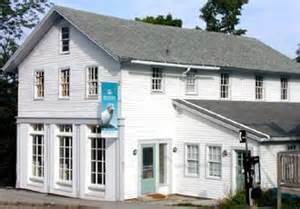 MERI occupies a white clapboard building in the village of Blue Hill, Maine, not far from Acadia National Park, on Penobscot Bay. One night, Paul Mayewski, Director of the University of Maine’s Climate Change Institute, gave a talk there entitled “Does Erratic Weather Mean the Climate Has Changed?” His conclusion: yes, it does. He said, that is very plausible. Perhaps you should be giving this lecture. We spoke briefly afterwards, and agreed to exchange books–my novel for his memoir of decades collecting ice core samples from the poles and Himalayan glaciers, Journey Into Climate. After I received Prof. Mayewski’s book, it was obvious who got the better deal. I skimmed the beautiful photos immediately. But it was only the other day that I read the text. 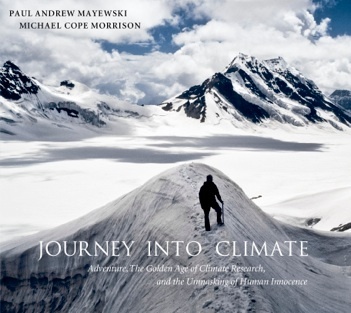 I suppose I had put it off because I worried that it would be dry, or self-promoting, or both—not that Prof. Mayewski doesn’t deserve to brag about his fantastic accomplishments, which have been key to understanding the history of our climate. But the striking thing about the story is how genuine and humble it is. It is not a travelogue. It is a story of discovery in which he is not the great adventurer, but the reluctant vehicle of the truth. The text gives the sense that he was (and still is) surprised and chagrined at what his research tells him: that the climate is changing far more rapidly than he expected. I think he’s worried. I had a bit of that sense as he talked in Blue Hill. The facts he threw out were not comforting. One that sticks with me, because so many people reflexively think it’s a benefit of climate change: the growing season in Maine is 23 days longer than it was 40 years ago. He didn’t say it, but I strongly suspect Prof. Mayewski finds this very alarming. If the growing season stopped its lengthening at 23 days, that might indeed be a boon. But global warming is accelerating. Twenty-three days is just a milepost on our journey to imminent instability. I highly recommend this volume as a gift for the skeptic in your life.